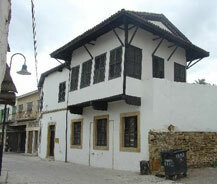 The Eaved House lies immediately 10m to the south of the Sultan's Library. Its name comes from the large eaves that overhang the yard. The house has its origins sometime in the Middle Ages, despite the fact that you'll have difficulty recognising anything from this period in the construction in the present day. Most of it seems to be characteristically late Ottoman in style, and certainly the "1932" writing over the door gives a better clue as to the date of much of the building. Completely renovated, the house is now a charming centre for culture and the arts, with gallery space, conference facilities and outdoor seating areas. Usual exhibitions are held here, including some organised by the British Council, and at such times catering facilities might also be offered. Supervisor is a source of local knowledge and will happily talk about Lefkosa's vivid history.